The popular Manga and Anime series Fullmetal Alchemist is getting a live action version late this year…and it looks good! 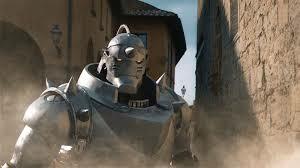 I think fans of live action fantasy films, such as the Harry Potter franchise, will really enjoy Fullmetal Alchemist. Similar special effects, magic spells and monsters blended with live action adolescent heroes learning to control their powers should be very reminiscent to the Harry Potter fans…or at least hold them over till the next Harry Potter film comes along. The story follows the Elric brothers and takes place in an Edwardian-style world where alchemy is a science mostly controlled by the government. The brothers attempt to use forbidden magic to resurrect their dead mother but the experiment goes horribly wrong resulting in one of the brother’s soul being bound to a suit of armour. Director Fumihiko Sori (who was one of the head special effects leads on James Cameron’s Titanic) has vowed to make this live-action movie as close to the anime as possible. The movie has been filmed entirely in the beautiful nation of Italy with an completely Japanese cast, but Sori has said that nothing in the film will reference anything Japanese. This is a cool technique to create a unique world and will hopefully help this film succeed where other Anime to Live Action films (Dragonball Z) have failed. The movie opens in Japan in December 2017.